After a whole host of issues and delays, a new launch date has finally been announced for Liverpool ‘Baby Grand’ 245 - the tram is set to enter public service on the Birkenhead tramway for the first time ever on Saturday 12th September. It may be remembered that the tram should have been launched last year but various setbacks have delayed its entry into service, however following extensive testing it is almost ready to roll! A suitably lavish ceremony is planned to celebrate 245‘s launch on 12th September and to cope with demand, two ‘launch’ trips are planned – although somehow riding on its second passenger run in preservation doesn’t seem quite as exciting as the first, but the same £10 price tag applies nonetheless! A series of speeches will take place at 1230 with representatives of the Merseyside Tramway Preservation Society, Liverpool Museums and the Heritage Lottery Fund set to address the crowd. 245‘s first run is scheduled for 1300 from Taylor Street with other ticketholders invited to enjoy refreshments in the depot, and then the second ‘first’ run will be at 1330 with those who rode on the actual first passenger journey then given the opportunity to sample a replenished buffet. For both journeys, 245 will follow Birkenhead 20 which will have a silver band playing from the vantage point of its open top deck. Once the official celebrations are over, a two-car service is planned to operate from 1400 using 245 and one other tram, possibly Liverpool 762. However a special premium fare of £5 will be charged on 245 for the remainder of the afternoon, with genuine tickets from Liverpool’s Last Tram Week issued to passengers to mark this historic occasion. It is hoped that the Baby Grand will be in service again the following day with normal fares applicable, and it should also be one of the star attractions at this year’s Bus & Tram Show on Sunday 4th October. September is certainly shaping up to be a very hectic month for fans of traditional British trams with significant events being held at Birkenhead, Crich and Blackpool over consecutive weekends, but at least none of them clash! Hopefully Liverpool 245‘s belated launch will be a great success for the Birkenhead tramway and after a year of difficulties the tram can now enjoy a very fruitful career in its new home. Suppose the decision to the Merseyside Tramway Preservation Society made to donate £1000 to the National Tramway Museum to help fund the work on Liverpool 869 has to be found from somewhere hence decision to add premiums on the 245 Launch day through £10 1st & 2nd trip premium and £5 their after for the rest of the day. Perhaps unfortunate when you consider how many people purchased hotels / train tickets for one of the previously aborted launches. I completely agree with Martyn that this represents good value, those who don’t are not compelled to participate. As for Christopher Callan’s churlish comments linking the cost of tickets to the contribution made by the MTMS to the overhaul of 869, does he have any evidence for the link? It is quite probable that different budgets are involved; the MTMS is a private organisation that can appply their funds as they think fit. Or does he not want to see 869 back in service at Crich, probably later this season? 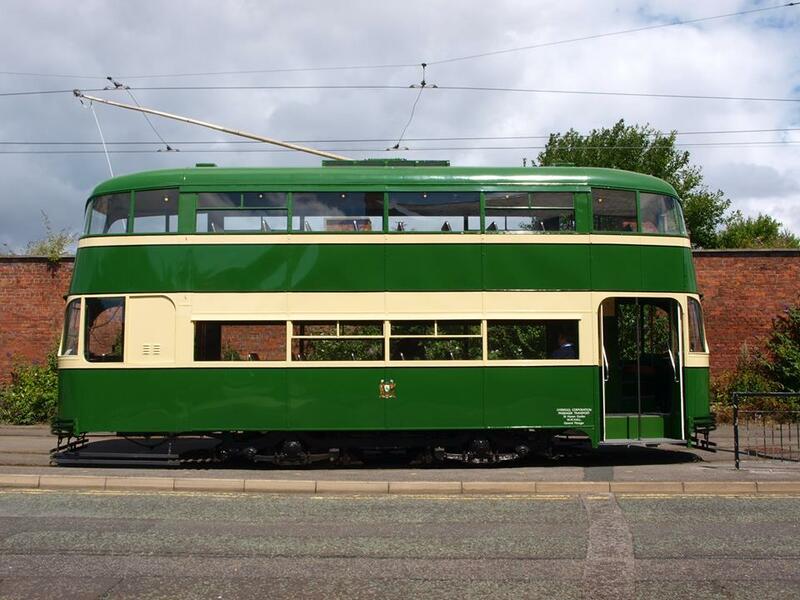 The prospect of more Liverpool trams in heritage service than there have been for some considerable time should be pleasing to most enthusiasts, particularly as 2017 will see the 60th anniversary of the end of the Liverpool operation. An interesting point about the anniversary in 2017 – the perfect excuse to reunite 245 & 869 perhaps? Now that’s an event I would certainly pay a premium price for! Big G is correct, there is no connection to the two funds and when the MTPS sent the tram to Crich for every one to enjoy they did have an obligation to help financially. It would be nice if Crich sent 869 to Birkenhead in 2017 so that four of the last five remaining Liverpool trams could stand together as a family but that will take a lot of planning and at present there is no space at Taylor Street depot as we now have two trams off the track and a third stored at Hooton. First I’ve ever heard of any such obligation… I am looking forward to riding on 869 again, but the idea of another society donating money towards its overhaul doesn’t sit well with me I’m afraid. The MTPS have so much responsibility now they are wholly responsible for the Birkenhead line and its fleet of trams, I can’t understand the logic behind helping another museum financially. Would Crich do the same if the boot was on the other foot? 869 was already in the workshop long before the MTPS decided to donate the money so I doubt that this would have prevented its return to service either. As for 2017 – the obvious solution to the lack of space would be for Birkenhead & Crich to swap trams for the season with one of the MTPS cars going to Crich on loan for the season – perhaps Wallasey 78, which would fill a major gap in the national collection, albeit temporarily. Obviously finance would be an issue but that’s the sort of thing that I for one would be interested in getting my cheque book out for! £10 for a FIRST trip with a buffet does seem very reasonable. Think many (and looking elsewhere am not alone) take umbrage at the decision to create premium £5 ticket for the rest of the day. A National Lottery Funded project launch should be as inclusive to wide spectrum of people as possible. Am sure many ordinary regular locals who have visited regularly and seen it operating on test will want several rides on its Launch day and feel part of the celebrations. Based on the information provided you can see it racks up at alarming pace. Now if a Unlimited Day Ticket (Excluding First Launch) was announced as part of package suddenly this concern goes away. Think the entire preservation movement needs to more careful about price points narrowing the potential reach. Yes premium aspects are important with first trips often commanding a premium price at various locations. But certainly think its regrettable to make ALL trips on the tram that day premium priced. Regarding 869 All enthusiasts want tramcars to run (well i thought that was the case till 602…) Am sure its return to service will be very well received. Perhaps if Crich had simply asked people to directly contribute to 869 rather than been seen to be taking money off an organisation quite clearly still adapting to life after assuming total responsibility for the tramway. I think that there are three issues here. Firstly there is a lesson that unfortunately needed to be learned – never book accommodation/ travel unless it is refundable, even if it is cheaper as events outside of the control of the museum can affect schedules. Second, having a premium price makes a lot of sense as some would come in for free using their membership of other museums. Personally I think that a lot of Galas/ Special events should attract a premium charge. Thirdly the comment re 869. Crich is very lucky that the sponsor groups who rescued the trams are still involved in their upkeep. For example the LTHS have supported various Leeds cars and the work of the FTS and LCCT have been a massive support, in this case it is only natural that the MTPS should have an involvement with 869. I must admit, I like Andrew’s comment on getting 245 and 869 together. WE can but hope! Being a member I have always thought that the MTPS have sold them selves short on what they charge. A friend just took their 2 children to London from Sussex and it cost £200 for the day out! This is 2015 and they have done magnificent job on all their cars and especially 245 that is a real credit to them. At the end of the day the premium fare is only for one day. I would imagine that the MTMS are possibly anticipating a lot of people wanting a ride and the fare structure is possibly to deter large numbers of people staying on the tram for several trips and resulting in others not being able to get a ride on it at all. Really a matter of supply and demand. As for the donation towards 869, the society’s purpose as its name implies is for the preservation of Liverpool trams so seems reasonable in my opinion. I’m sure the society would not have made the contribution if it could not afford to. Ken the MTPS run Birkenhead not MTMS. You could say no free passes and members would pay rather than ripping everyone off with £5! The £5 is to me the issue. How u have for a few rides compared with Blackpool Heritage or even Crich? MTPS is what I meant, unfortunate typing error! I don’t want to pay £5 for one trip either, so I will stay away on day 1. In fact I will stay away for a few weekends until some of the fuss has died down; it will still be same tram! Well once the dust settles and opportunity knocks perhaps we could have a couple of low loaders run between Crich and Taylor St and Rigby Road. There is a ready market for steam charters – an eight mile UK tramway museum featuring visiting cars as well as the home fleet must be a realistic prospect having regard to all the other sacred cow “can’ts” already slaughtered in Blackpool.